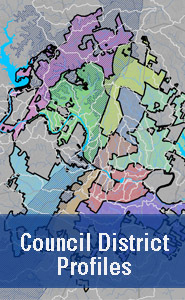 The Watershed Protection Master Plan uses technical assessments to determine the severity of existing and potential future problems. These studies are used to prioritize problem areas for each of the three departments’ missions to reduce flooding, erosion, and water pollution. 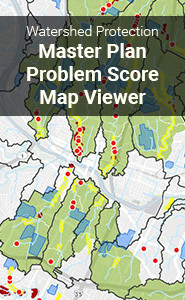 Problem scores range from 0 to 100, with a score of 0 reflecting ideal watershed conditions and a score of 100 representing the worst problem identified. Numerical values are determined specific to each mission, considering potentially threatened resources. Flood problems are caused by many different factors. Hydrologic and hydraulic modeling helps analyze effects of land cover, floodplain geometry, and rainfall intensity. Flood scores reflect threats to public safety and property, as well as flood severity. For large creeks and waterway systems, flood problem scores are calculated for structures and street crossings. Floodplain models calculate predicted flooding depths and flow velocities for storm events. For flooding outside of the creek’s floodplain, modeling and citizen complaint data is used to identify and prioritize problem areas, which are mostly associated with poor or outdated storm drain systems. Erosion problems can stem from changing land use conditions that increase the quantity and velocity of stormwater runoff. Stream channels react to these changes by widening and deepening, which can cause creek bank failures, threaten creekside structures, and degrade water quality. Other problems occur due to improper placement of buildings, parking lots, and utilities. Erosion problem scores are based on the number, type, and severity of the threat to structures, infrastructure, and other valued features located along stream banks. The scoring system takes into account factors such as distance of resources from the steam bank, bank stability, vegetative cover, and stream meandering. Areas or structures located near creek bends, steep slopes, high banks, and/or poor vegetative cover are expected to have high problem severity scores. Water quality problems are multifaceted and complex to study and control. Key concerns include increases in runoff and degradation of aquatic and riparian habitat. Problems are measured using the Environmental Integrity Index (EII). The Environmental Integrity Index scoring system assesses water quality using 6 categories. Each factor is based on numerous field measurements. Healthy creeks have high Environmental Integrity Index scores. Streams with more urbanization have excessive sediment, nutrients, toxics, bacteria, and other concerns, and have lower Environmental Integrity Index scores.